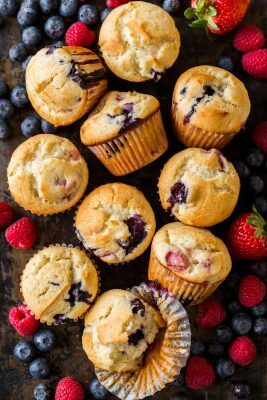 These fluffy and moist triple berry muffins come together quickly and are loaded with juicy strawberries, raspberries and blueberries. Line a 12-count muffin tin with cupcake liners and preheat oven to 400˚F. In a large mixing bowl, using an electric mixer, beat 2 eggs with 1 cup granulated sugar on high speed 5 minutes, or until thick and light in color. Add 1 cup Greek yogurt, 1/2 cup oil, 1 tsp vanilla. Set mixer to low speed and mix just until combined. In a small bowl, add 2 cups flour, 2 tsp baking powder and 1/4 tsp salt and whisk to combine. Using a hand held whisk, add flour mixture into the batter 1/3 at a time, stirring to incorporate with each addition. DO NOT OVERMIX or muffins will be dense. Use a spatula to fold in 1 1/2 cups mixed berries, folding just until combined. Divide batter into prepared muffin tip, filling to the top or until all of the batter is used up. Bake in the center of the oven at 400˚F for 20-22 minutes or until tops are golden and a toothpick inserted into the center come out clean. Transfer muffins to a wire rack to cool. Serve warm or at room temperature. *Spoon the flour into a measuring cup and scrape off the top for an accurate measure.